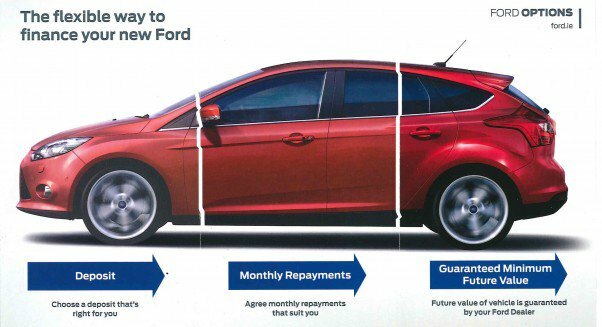 Ford Options is a brand new Personal Contract Plan (PCP)product that gives you huge flexibility and a lower monthly amount over the repayment period. Choose your deposit between 10 % – 30%, agree a monthly repayment that suits you and drive away with the added peace of mind of knowing your vehicle’s Guaranteed Future Value. At the end of your agreement, you can then choose to either Return, Retain or Renew your car! Now available on almost all the models in the Ford Range. Ford Options is fully explained in this page: Ford Options. The following are a series of Ford Options examples for various Ford models in the range. If you would like to receive a finance quote on any car in the range please contact any of our Sales Team of Carl McCarthy, James Foley, Sean Herlihy, Liam Herlihy or Shane Collins on Lo-Call 1850 500 300 or 063 30300. The finance costs displayed are typical prices and are meant for illustrative purposes. They are not intended to act in place of an accurate finance quotation received in writing from Cavanaghs of Charleville. The prices quoted are valid as of 01st Nov 2019 and are subject to change. The choice, price and specification of cars displayed on this page may differ at any point in time with what’s in stock or available to order. Please enquire directly with us to identify what is available from stock or to order and for final confirmation of price. Lending criteria and Terms & Conditions apply. Cavanaghs of Charleville Ltd is a credit intermediary regulated by the Central Bank of Ireland.